Emily Midgett <—— you are here! You should have arrived from Amy’s blog, and your next stop is Lisa’s blog. Be sure to leave all of the blog hop participants some love on each of their blogs, because you will be entered to win one of FOUR $25 gift certificates to The Ton Stamps! Now, on to my projects. I used the absolutely adorable Darling Flamingos stamps, as well as the sweet pineapple image from Stand Tall, in conjunction with a palm frond from Mini Wild Florals to stamp a pattern on a simple A2 card base. I stamped the flamingos with the Ruby Collection, the pineapple in gold Delicata ink, and the palm frond in Bright Fern. The greeting from Basic Labels was stamped in Noir ink, then fussy cut. I triple cut the Fabulous die from black cardstock, layered all of them together for a dimensional die cut, and adhered it at an angle, then popped up the labels with dimensional adhesive at a wonky angle. My last card for the release is a shaker. It wouldn’t have felt like a release from The Ton without a watercolored floral background turned into a shaker card. To start, I heat embossed the stunning new Cherry Blossom Garden background using White Satin Pearl embossing powder onto watercolor card stock. I then painted the image using a pink, black, and gray color scheme with my Zig markers and a wet paintbrush. To create the shaker, I simply die cut some of the silver glitter paper using the largest two dies from the Stitched Rectangle set to create a frame. I filled my shaker with a variety of pink, charcoal, white, and silver gilding from the store. The greeting was from the Lucky Tulip set, white heat embossed on a strip of black card stock. The final touch was to add a few single blooms from Wild Cherry Blossoms that I’d watercolored with the same Zig markers. Perfect take on that inspiration photo! Awesome! Super love your fun cards! Your cards are so eye catching. Love them both. I love the fabulous backgrounds you've created and your lovely shaker, too! What great dimension on your second card. Outstanding! Oh your take on the watercolor print is spectacular! Wonderful cards! WOW! LOVE both cards today! They are stunning! I must admit I like your take on the inspiration piece better than the original. Lovely. These are both fabulous, but my favorite has to be your fun flamingo print. It's perfect for summer and I love the sentiment you created. Awesome pattern stamping on your first card and beautiful second card. Love your beautiful flamingo background and the cherry blossom shaker card is soooo pretty! the shaker card, so pretty. Lovely cards as always. Shakers are my favorite and yours is just beautiful. Love the cherry blossoms. You've replicated that print of the flamingos, beautifully. That shaker card is spectacular. Love your cards especially the Always Cherry Blossoms card – beautiful. Love seeing your water coloring creations. Emily, these cards are fabulous & so fun! Beautiful cards. Tfs and the chance to win. Ok great inspiration and I adore your first card. Love the bright colors and all the stamps together are definitely meant to be together. Love the shaker card. Such a beautiful cherry blossom card I think I have ever seen. Wow! I'm going to need the whole summer line! Both are beautiful and great job on the inspiration piece….perfect reminder to look at designs for inspiration for cards! Hi Emily, I love your take on the inspiration photo, perfect. Thanks for sharing and inspiring. Very lovely card, thanks for sharing. Awesome background with the flamingos, and gorgeous card with those beautiful cherry blossoms! Both cards are beautiful. The second one is stunning! The flamingos are so cute but the cherry blossoms are just WOW!!! The layout and colors are phenomenal. Love your cards, they are all fantastic but I adore the cherry blossom shaker card the most! Wonderful cards! Love the flamingos! Gorgeous cards!! Really love the shaker card!! What a lovely shaker card you have created! Beautiful cards!! The flamingo card is awesome!! Love the shaker card!! Big fan of the shaker with all those cool new sequins! Love the flamingos too! Gorgeous cards made! Love the shaker!! Thanks for sharing! Pretty cards love the backgrounds! Great release. These cards are so fun! Love your flamingo card and the inspiration you used. Perfect! It is amazing the ideals you come up with when making your cards. Fabulous cards! Very creative and very inspirational!! Fantastic cards! Love the flamingo background and I really like that you made the cherry blossom card a shaker! 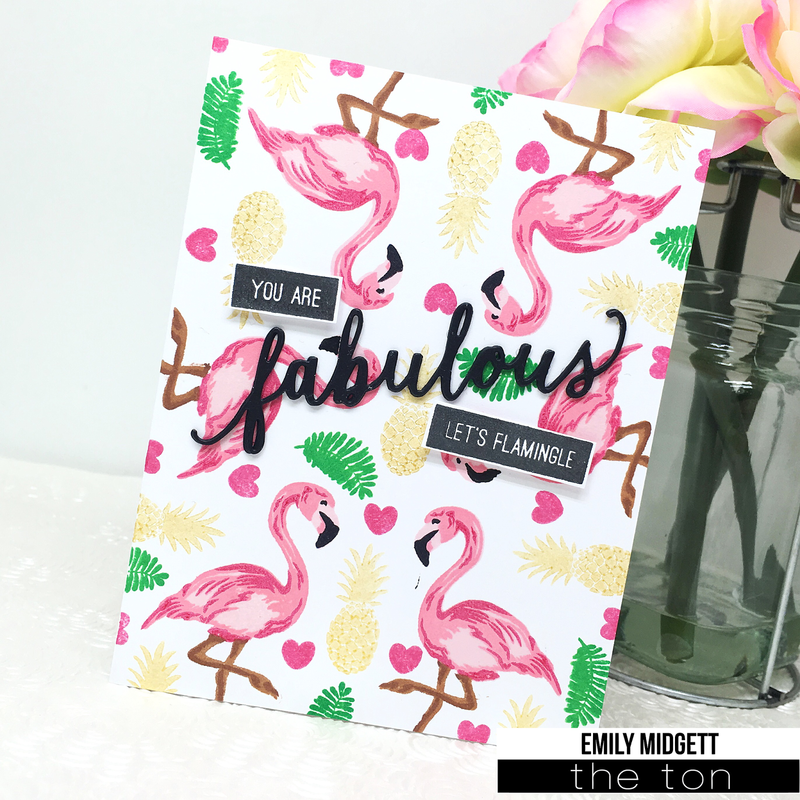 Love your flamingo card – such lovely colours! WOW – your flamingo panel is SERIOUSLY AWESOME, LOVE IT, LOVE your DELIGHTFUL cherry blossom shaker too!!! I love love your shaker card!!!! 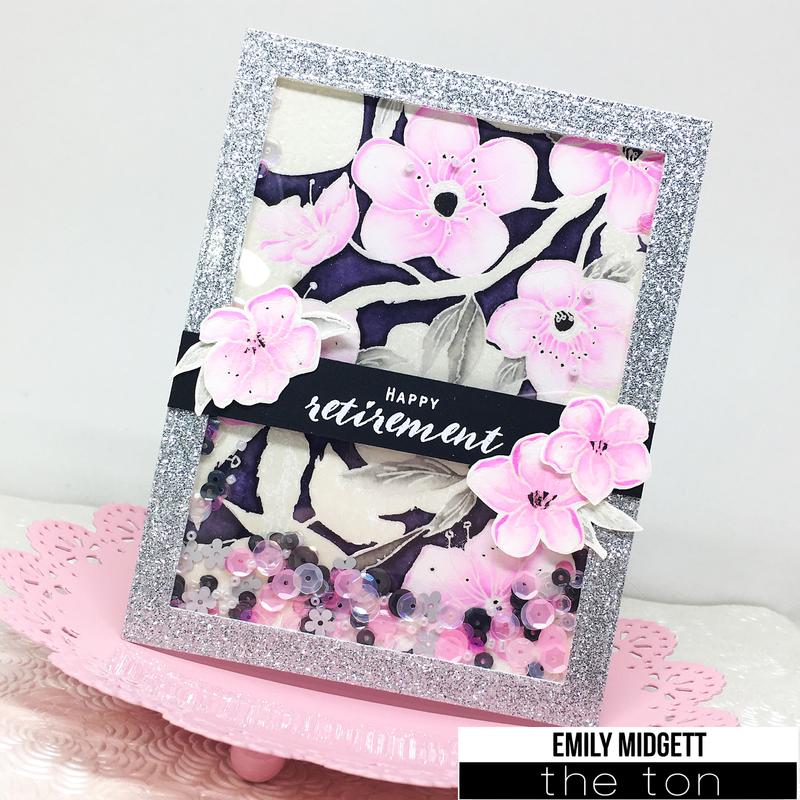 Love the background you created on that first card and love those blossoms and the shaker on the second! Your cards are amazing and just so beautiful!! Love the coloring on each one!! Hi Emily ~ Your take on the inspiration piece was spot-on! But….that Cherry Blossom card? WOW!! I'm a sucker for shakers cards and this one has to be the most beautiful and elegant one I've EVER seen. Absolutely stunning; truly. Your card alone makes me want that stamp set. Now! LOL Thanks so much for sharing and inspiring; your cards have been amazing. Great interpretation of the print on your flamingo card and very pretty shaker card. What a fantastic inspiration picture, you really nailed it with your stamped card. And those beautiful blossoms in the shaker look divine! I like your card better than the inspiration! Beautiful cards and love the inspiration behind them! This shaker card is absolutely perfect. Gorgeous cards! Your flamingo card is WAY prettier than your inspiration photo! Oh, what amazingly BEAUTIFUL cards – just awe-inspiring!! You did such a fabulous using the inspiration photo – wow! I don't think I have ever seen a more beautiful shaker card! Absolutely gorgeous! I love the fun flamingo card too! WOW, gorgeous cards! Thank you!